If you follow Instagram interior accounts or have flicked through Loaf’s catalogues with lovely sofas and amazing pieces of art, you must have already heard of Ben Lowe. Ben Lowe is a British artist whose artwork explore human emotions. 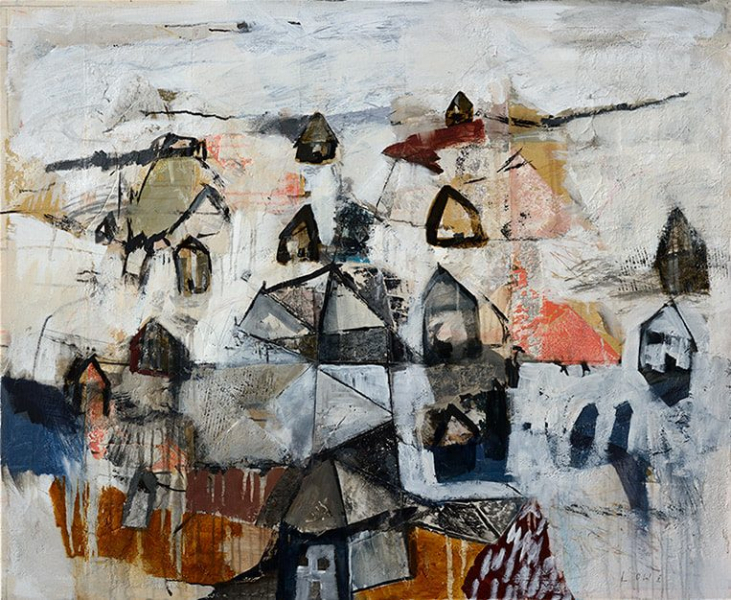 His work straddles different artistic styles, using figurative and landscape elements to provide context, and layers of abstraction to capture the atmosphere and feelings of emotion. Lowe’s variety and depth of source imagery, coupled with his command and subtle use of different styles, results in complex but accessible artwork that is both rewarding and evocative. We spoke with this talented artist to learn more about his work and his views on art and the Home Staging industry. Home Staging Association: Do you remember your first interaction with art? Ben Lowe: I can vividly remember a school trip to the Tate, when I was probably about 9 or 10; And I was blown away by the Rothko room. I loved the scale of the canvases and the style of painting - it was totally different to anything I’d seen before. HSA: How would you define your style? BL: It’s clearly been shaped by the abstract expressionism that interested me so much as a kid. I usually like to introduce slightly more defined landscape of figurative elements to get the idea across in more detail. HSA: What other artists influence you? BL: I think I’ve inadvertently taken tiny bits from hundreds of artists that have come before me - all the usual suspects and some lesser-known artists. I tend to dive in and out - just enough to get inspired; I don’t study other artists too much. HSA: How did you first begin to develop your unique style? BL: I was given an old box of oil paints by a relative; I was probably about 10 years old. I can still remember the musty smell of the paints and brushes (a bit like my current studio!). I used to sit for hours painting in different styles working out what was what. Over the past 20 years I’ve explored diverse subjects, played with different materials and tried to maintain an honest, stripped-back style. HSA: How do you nurture your creativity? BL: I’m permanently looking for what could make the next painting. Inspiration is everywhere and it’s important to be ready to spot it when it arises. I’m constantly working (in-between looking after two lively boys!) because ideas, productivity and momentum all go hand-in-hand. HSA: How does it feel to be featured in so many interior design and home staging projects? Was it something that you planned on doing or did it happen naturally? BL: I’m grateful! It wasn’t anything strategic; I quickly realised that designers appreciated my style and that the paintings worked well in most interiors. I’ve worked with some hugely talented designers on incredible projects - I really appreciate what they do. HSA: Do you ever try to guess what sort of room will be getting your paintings? BL: Not really, unless it’s a commission - in which case it’s perhaps in the back of my mind. HSA: Do you have any tips on how to choose the best artwork for staging a home? BL: Be brave! - because artwork can make or break a room. Try designing the room around one great piece of art. And if you can’t find what you want, then approach the artists you like and see if they’re willing to create a commissioned piece for you. HSA: What are you working on at the moment? BL: I’m starting some new pieces for the next collection, and wrapping up a couple of commissions, both for London-based residential projects. I’ve also got some gallery pieces to prepare; for shows later this year. HSA: Where can people purchase your work?